Curious about the Amish? 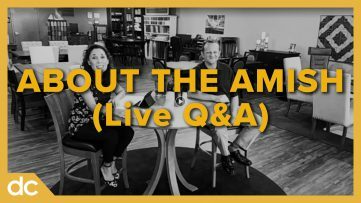 We are live with DutchCrafters Amish Furniture CEO Jim Miller in our Sarasota Florida showroom to answer your questions. Pull up a chair, listen in, and ask questions by leaving a comment below. Also check out our blog follow-up to this video, About the Amish on the Timber to Table Blog.